Raven doesn’t like thunderstorms. She woke Nick, then Luke then me up last night to let us know at 3:30 am that the thunder we were hearing in fact was disturbing her. Dylan didn’t like thunder when he first got to the house, but now he doesn’t care as much. He ended up going into the room where Raven was and I think that helped her feel better. Nick ended up with Raven as the end. She has decided that the boys belong to her now. I think I need to start getting up even earlier to get everything done in the day. I’ve got a lot of moving pieces that in the end will drive me nuts. I didn’t walk at all Monday and had an abbreviated walk yesterday. Somehow I need to get on a walking schedule that works with my new schedule. In the end the school communicated with us, and all was well. I did think about having Jaki go to the school and get them (she even offered) but decided that wasn’t the best course of action. In the end the boys were fine. Although they mentioned that more than a 1/3 of the school was gone their parents came and picked them up. I am over allergies. If anyone would like mine email you address and I will send them post haste. Rain and DC = long commute. Easier day one than July 11, 2011. I guess we all mature at different rates. Got home late, fried in fact so we didn’t go on a walk. That is the first day we’ve missed walking Raven since she joined us more than 4 weeks ago. She and Dylan glared at me for awhile when I got home. I installed the new Netatmo rain gauge on our weather station over the weekend. Now that system is only missing wind speed and wind direction. At least it is for me. The new PC and iOS software is very cool for the system. It looks like one of the fancy systems used by the televisions stations. You can see the trends and actuals from your own house as to what the weather is doing. Posts for the other blogs I do are in progress. I am putting finishing touches on one draft and the other should be on paper for May publication. It seems strange to me that its nearly May. Both Dylan and my mother have upcoming birthdays. Since we don’t know Dylan’s actual (or Raven’s) we’ve chosen the Boys (and my father’s birthday) for Raven and my mother’s birthday for Dylan. Since my mom adores Dylan we figured that was only fair. He will be either 3 or 4 this year. In June he will have been with us for 2 years. I can honestly say I have never had a better dog. Way to many projects this weekend. We had the play yard removed as I mentioned in yesterday’s post. Sunday included cleaning up the play yard area and having the old couches removed. July 11, 2011 and August 12, 1996, and now today April 28, 2014 are all first days. I am very excited for my new path and direction. I do miss all of the wonderful people I worked with previously. I made some great friends there. Actually I’ve made great life long friends everywhere I’ve worked. I don’t see the folks from Cincinnati as often as I would like but when we touch base it is wonderful. Lots of projects to get going in the next few days. This is a transition week for walking. Hopefully timing will work out and we will be able to walk in the evenings. If not I may have to start getting up early in the am to walk before work. Dylan and Raven are both walk fanatics now. They don’t like day’s without walks. In fact I don’t think we have gone a single day since Raven joined us without a walk. Time to get rolling! Monday has returned. We had the play yard removed from the backyard of the house. There was a huge pile of dirt under the play yard (unexpected) that we have to deal with now. Its spring project time. We have a number of indoor and outdoor projects going on. You buy the perfect house and then of course you spend the next 10 years modifying it. This time however, I will not be adding a pool. We have a neighborhood pool that is quite nice. Our last three hours that we’ve owned haven’t had fences. The one we leased in Gaithersburg had a fence. Dylan loved the fence so we are adding on to this house for the dogs. The other part of course of spring is the reality of allergies. I hate allergies. My throat has been sore for 3 days. Not red infected you have strep sore but annoying sore. Its not like I spend the winter indoors and moving to the outdoors I am suddenly struggling. Rather it’s the pollen in the air that gets me. What I need is a vacation (which I just had). Actually what I need is to get back to work. 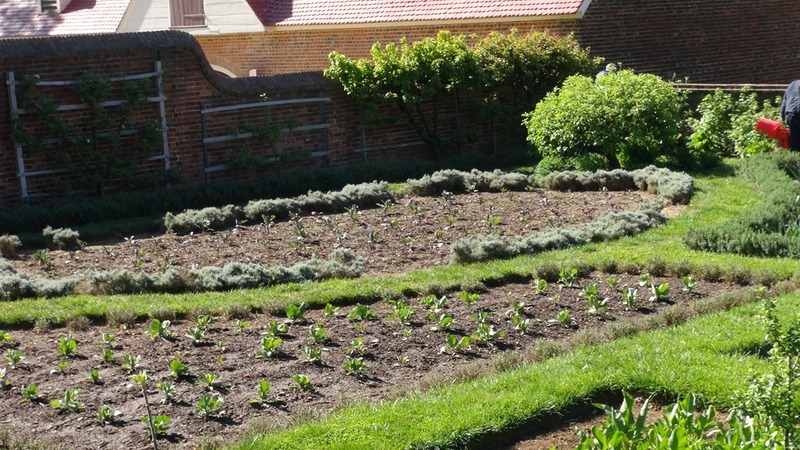 Picture is from the amazing gardens at Mount Vernon. Simply an amazing place to go in the spring. As long as you can breath through your feet so the pollen can’t get you. I got the NetATMO rain gauge yesterday. Barb took one look at it and said “How many weather stations do you have.” I responded “not enough.” She grimaced – I suspect under her breath she was uttering geek. Netatmo is a great home weather station. It publishes your weather information to their web server so you can log into your weather no matter where you are (like connecting from Hawaii when it is –3 in DC would be a fun use of the remote capability). I Still think NOAA and NetAtmo ought to get together and do a data feed share. Today Netatmo supports the NOAA feeds in their software. It would be really cool to see a heat map of an area based on lots of points of data. An aggregated weather feed application if you would. I also have a Davis weather station on the back deck. It is a more professional weather station and gives real time rain and wind velocity and direction information that NetAtmo doesn’t today. Well Netatmo has a rain gauge but I haven’t installed it yet. I suspect they have a wind gauge in the works but to date I haven’t seen that on their product page. The Davis system also allows you to do weather data mining. It keeps track of 10 days of data so you can do a compare and contrast. For example, we live near DC, DC has a lot of concrete. It is normally 3-5 degrees warmer than where we live (near the woods in fact about 23 miles North of DC). The other interesting thing of course is the amount of rain. It truly varies across the region we live in. So its nice to be able to look out and see what the rain is where we actually are. It is also a great opportunity to teach a fun science lesson that in the end is extremely useful. If you know how to read the weather where you are, you are less likely to find yourself in a compromised position. I will post a fun STEAM/STEM activity later around this. Its interesting when you think about creating an environment for sound in your home. The previous owner of our house put in wiring for speakers in the main viewing areas of the house. At some point I have to get someone to fill those in. I have moved to using Sonos speakers that are wireless. Although for the new Samsung TV upstairs we did get the Samsung sound bar. More lazy on my part than a failure in the Sonos system and we got a great deal on the Samsung Sound-bar as well. I finally got the last of the books unpacked yesterday. Once upon a time (in my 20’s) I had more than 2000 books. Now I am down to a much smaller number figure around 300 or so. I still have a lot of books but most of them occupy a small space in my office (on my kindle). Part of the book collection had been sitting in my old office, and I don’t think I am getting a new office other than the one in the basement so I pulled the business books and put them on shelves as well. Now once them come and haul away everything on Sunday we can finish the basement and get our movie posters up. We are putting up five movie posters in the home theater. Well 3 movie posters and 2 game posters. We keep talking about doing it, and frankly just need to get it done. I also need to move my LP’s to MP3. I still love the sound of hiss and crackle you only get from a record player. There are a number of possible captions for this picture. Want to hide on a couch? Dark dog, dark couch. 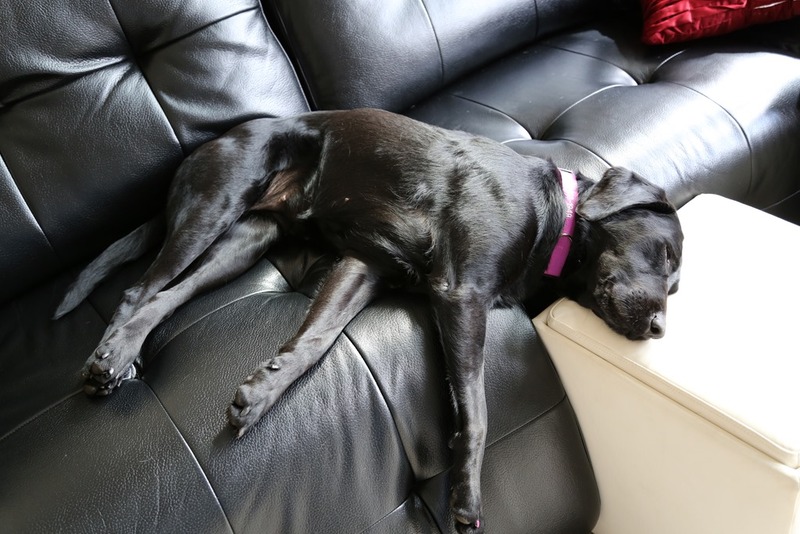 What happens to labs when their boys go to school. Thanks goodness for ottomans. I could go on. This is a picture from the new camera of Raven. She was sad after her boys went to school. She joined our family 3.5 weeks ago. She seized control of the family about an hour later. Olney Theater is producing a number of Shakespearian plays this week. I am super excited to go see MacBeth. We love the Olney Theater. When we first moved to Maryland we went to the Arts Barn in the Kentlands a number of times. We found out about Olney about a year into living here and since then we have been to a number of plays. They are always well produced, well acted and exceptional. Even the boys have gone to a couple – so far their favorite (of course) was the production of “Little Shop of Horrors.” They are going with us to MacBeth so it will be a fun family event. The labs elected to stay home rather than sit for 3 hours in a theater without any opportunity to be petted. I finally got shelves for the basement so I can upack the rest of the LaserDiscs (yes we have a number of old movies on Laser Disc), books and records. I am going to finish recording my records to MP3’s. I have a lot of Classical Music that is best on LP’s.